“Abu Izzadeen aka Trevor Brooks: 5 Fast Facts You Need to Know,” Heavy.com, March 22, 2017, http://heavy.com/news/2017/03/abu-izzadeen-trevor-brooks-london-uk-parliament-not-suspect-westminster-terror-attack-terrorism-name/. Born Trevor BrooksRoxanne Escobales, “Q&A: Abu Izzadeen,” Guardian (London), April 18, 2015, http://www.theguardian.com/uk/2008/apr/18/uksecurity2., Izzadeen is a Muslim convert of Jamaican descent. Izzadeen’s parents came to the United Kingdom in the 1960s and he converted to Islam at age 17.“Profile: Abu Izzadeen,” BBC News, August 17, 2008, http://news.bbc.co.uk/2/hi/uk_news/7353136.stm. Izzadeen reportedly radicalized in the 1990s after meeting Bakri Muhammad at the Finsbury Park Mosque.Duncan Gardham, “Muslim preacher Abu Izzadeen guilty of inciting terrorism,” Telegraph (London), April 17, 2008, http://www.telegraph.co.uk/news/uknews/1895959/Muslim-preacher-Abu-Izzadeen-guilty-of-inciting-terrorism.html. He then became a bodyguard for Bakri Mohammad.Murray Wardrop, “Islamic hate preacher arrested on terrorism charge,” Telegraph (London), November 3, 2011, http://www.telegraph.co.uk/news/uknews/terrorism-in-the-uk/8865616/Islamic-hate-preacher-arrested-on-terrorism-charge.html. Izzadeen became a primary spokesman for Al Ghurabaa, which was founded by some of Bakri Muhammad’s followers.“Profile: Abu Izzadeen,” BBC News, August 17, 2008, http://news.bbc.co.uk/2/hi/uk_news/7353136.stm. Following the July 7, 2005, terrorist bombings in London, Izzadeen called the bombings “mujahedeen activity” to “make people wake up and smell the coffee.”Alan Cowell, “Zambia Deports Terror Suspect Sought in U.S.; Britain Files Formal Charges in Attacks,” New York Times, August 8, 2005, http://www.nytimes.com/2005/08/08/world/europe/zambia-deports-terror-suspect-sought-in-us-britain-files-formal-charges-in-attacks.html. Jamie McKinnell, “Islamic extremists jailed for "serious and deliberate" breach of counter-terrorism restrictions,” Mirror (London), January 8, 2016, http://www.mirror.co.uk/news/uk-news/islamic-extremists-jailed-serious-deliberate-7142974. On Twitter, Izzadeen has posted numerous anti-Western tweets. 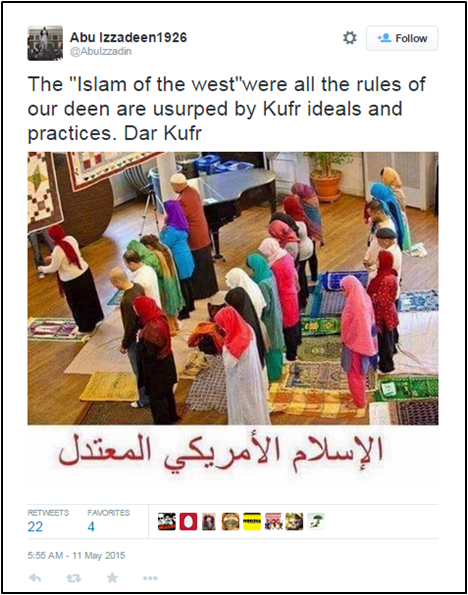 His May 11, 2015, tweet chastised the “Islam of the west,” which he perceives to have been “usurped by Kufr [nonbelieving] ideals and practices.”Abu Izzadeen, Twitter post, May 11, 2015, 5:55 a.m., https://twitter.com/AbuIzzadin/status/597701609267843072. Using the #Texasattack hashtag, Izzadeen issued a series of condemnations of the United States following the May 2015 Islamist attack on a Draw Muhammad cartoon contest in Garland, Texas. He called the contest “clear proof” that the United States had launched a “crusade” against Islam,Abu Izzadeen, Twitter post, May 4, 2015, 5:45 a.m., https://twitter.com/AbuIzzadin/status/595162247216902144. and condemned insults to the prophet under the guise of free speech.Abu Izzadeen, Twitter post, May 4, 2015, 5:56 a.m., https://twitter.com/AbuIzzadin/status/595165099138101248. Abu Izzadeen, Twitter post, October 15, 2015, 4:30 a.m., https://twitter.com/d08adeea5ef1431/status/654575069566529536. Several videos of Izzadeen’s speeches and interactions with British police are available on YouTube channels operating in his name. As of March 2017, one of the channels, created in March 2015, remains open but the videos have been removed.Abu Izzadeen, YouTube, accessed November 6, 2015, https://www.youtube.com/channel/UCyHTsKhVBZdP7Bp5F93oLoQ. Videos of Izzadeen remain up on another YouTube account, created in 2011. That channel, which spells Izzadeen’s name as “abuizzaddeen” is described as his official channel.Abu Izzadeen, YouTube, accessed March 22, 2017, https://www.youtube.com/user/abuizzaddeen/videos. 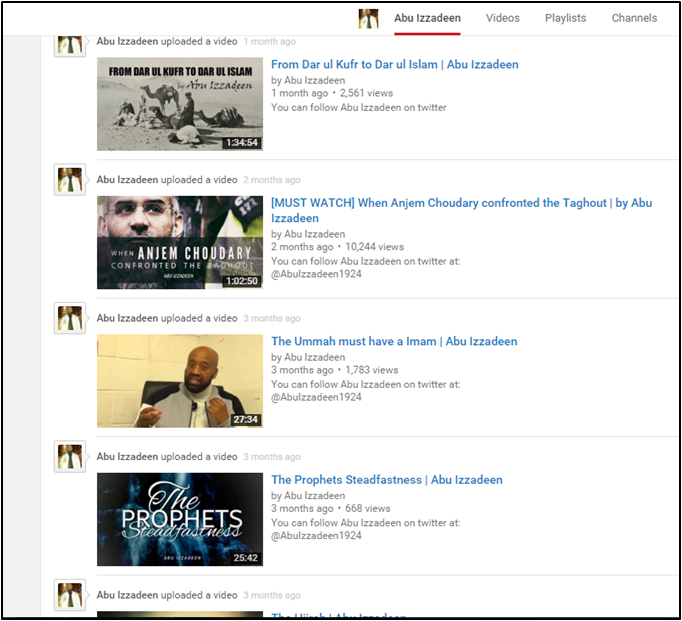 Screengrab of the YouTube channel Abu Izzadeen purportedly created in March 2015. As of March 2017, a YouTube channel operating on behalf of Izzadeen remained active but the videos had been removed. Videos of Izzadeen remain accessible on another YouTube account, created in 2011. “The Ummah must have a Imam | Abu Izzadeen,” YouTube video, 27:33, posted by Abu Izzadeen, August 1, 2015, https://www.youtube.com/watch?v=XK0_7i7XwpA. @AbuIzzadinAAbu Izzadeen, Twitter, accessed September 21, 2015, https://twitter.com/d08adeea5ef1431. @d08adeea5ef1431Abu Izzadeen, Twitter, accessed September 21, 2015, https://twitter.com/d08adeea5ef1431. @IzzadeenAbuAbu Izzadeen, Twitter, accessed July 31, 2015, https://twitter.com/IzzadeenAbu. Abu IzzadeenAbu Izzadeen, Twitter, accessed July 31, 2015, https://twitter.com/IzzadeenAbu. Abu Izzadeen1926Abu Izzadeen1926, Twitter, accessed July 30, 2015, https://twitter.com/AbuIzzadin. Omar Brooks“Profile: Abu Izzadeen,” BBC News, August 17, 2008, http://news.bbc.co.uk/2/hi/uk_news/7353136.stm. Omar IzzadeenRoxanne Escobales, “Q&A: Abu Izzadeen,” Guardian (London), April 18, 2015, http://www.theguardian.com/uk/2008/apr/18/uksecurity2. Trevor BrooksRoxanne Escobales, “Q&A: Abu Izzadeen,” Guardian (London), April 18, 2015, http://www.theguardian.com/uk/2008/apr/18/uksecurity2. 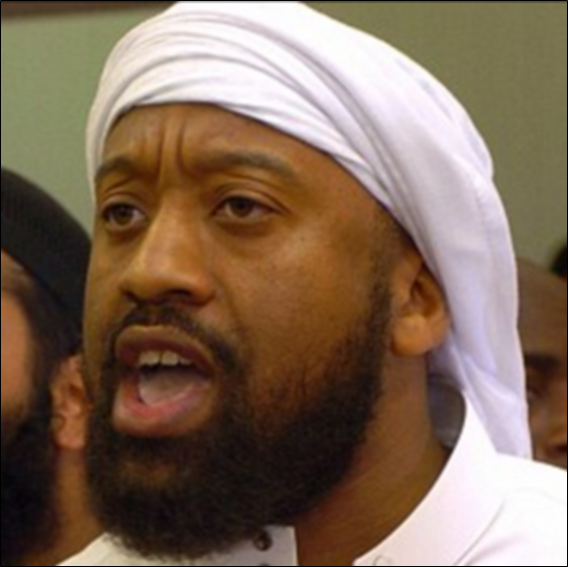 Abu Izzadeen is an Islamist propagandist and radical cleric who has been imprisoned in the United Kingdom for inciting and fundraising for terrorism and for association with radical Islamist groups Al Ghurabaa and al-Muhajiroun. @abuizzadeen1924“The Ummah must have a Imam | Abu Izzadeen,” YouTube video, 27:33, posted by Abu Izzadeen, August 1, 2015, https://www.youtube.com/watch?v=XK0_7i7XwpA. Inside the haram shareef”Abu Izzadeen Twitter post, September 12, 2015, 4:24 p.m., https://twitter.com/d08adeea5ef1431/status/642795960167497728. “Once your islam is confirmed you can be bombed based on suspicion, the burden of proof is upon the defendant and your murder is self defense”Abu Izzadeen Twitter post, September 7, 2015, 12:00 p.m., https://twitter.com/d08adeea5ef1431/status/640917558560976896. “Alhamdulillah Anjem choudary/abu baraa got bail may Allah reward those who remembered them in duaas & curse the haters! Die in your rage”Abu Izzadeen, Twitter post, September 4, 2015, 7:12 a.m., https://twitter.com/d08adeea5ef1431/status/639757964988022784. “This ummah will always be filled with those who run towards Allah never diverting their gaze never looking back”Abu Izzadeen, Twitter post, September 1, 2015, 11:53 a.m., https://twitter.com/d08adeea5ef1431/status/638741377690562561. “Twitter isn't a game your tweets must be directed to supporting Islam and championing our causes otherwise dont tweet”Abu Izzadeen, Twitter post, August 29, 2015, 11:17 a.m., https://twitter.com/d08adeea5ef1431/status/637645202644189185. “The reason the UK media is silent is because this government condones torture and murder of sunni Muslims by thier allies on the ground” (Tweet)Abu Izzadeen, Twitter post, August 27, 2015, 6:36 p.m., https://twitter.com/d08adeea5ef1431/status/637030982957334528. “Whoever allies with, supports by money, word or body the crusader coalition against Ahl sunnah is an murtad kaafar” (Tweet)Abu Izzadeen, Twitter post, August 22, 2015, 11:47 a.m., https://twitter.com/d08adeea5ef1431/status/635116171189161984. “Censorship on reporting Islamicstate victories leaves english lang media having 2makeup ever more unbelievable tales” (Tweet)Abu Izzadeen, Twitter post, August 20, 2015, 11:15 a.m., https://twitter.com/d08adeea5ef1431/status/634383196717760512. “Censorship on reporting Islamicstate victories leaves english lang media having 2makeup ever more unbelievable tales”Abu Izzadeen, Twitter post, August 20, 2015, 11:15 a.m., https://twitter.com/d08adeea5ef1431/status/634383196717760512. “That’s 40 soldiers to 1 we don’t exaggerate any Islamic state victories the figures simply speak for themselves” (Tweet)Abu Izzadeen1926, Twitter post, May 21, 2015, 10:08 p.m., https://twitter.com/AbuIzzadin/status/601570233602678784. “If your united behind one man and someone comes to disunited you kill him Saheeh Muslims” (Tweet)Abu Izzadeen1926, Twitter post, May 13, 2015, 2:38 a.m., https://twitter.com/AbuIzzadin/status/598376818450784256. “The ‘Islam of the west’were all the rules of our deen are usurped by Kufr ideals and practices. Dar Kufr” (Tweet)Abu Izzadeen1926, Twitter post, May 11, 2015, 5:55 a.m., https://twitter.com/AbuIzzadin/status/597701609267843072. “They betrayed Allah and the messenger allying the crusaders against Ahl sunnah but their day of reckoning is close” (Tweet)Abu Izzadeen1926, Twitter post, May 10, 2015, 11:28 a.m., https://twitter.com/AbuIzzadin/status/597422958781542400. “This is a frontier of Islam don't underestimate your role Allah may guide someone with your words always purify Niyah” (Tweet)Abu Izzadeen1926, Twitter post, May 8, 2015, 2:47 p.m., https://twitter.com/AbuIzzadin/status/596748279146242048. “Only the hypocrites fight for the worshipers of the cross this is the sunnah of Allah,camp of Kufr vs camp of Emaan” (Tweet)Abu Izzadeen1926, Twitter post, May 8, 2015, 12:52 p.m., https://twitter.com/AbuIzzadin/status/596719226267787264. 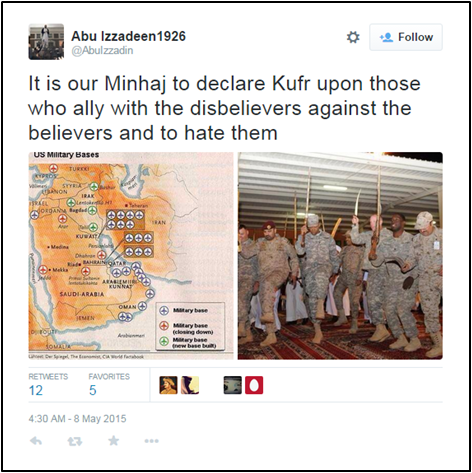 “It is our Minhaj to declare Kufr upon those who ally with the disbelievers against the believers and to hate them” (Tweet)Abu Izzadeen1926, Twitter post, May 8, 2015, 4:30 a.m., https://twitter.com/AbuIzzadin/status/596592942070026240. 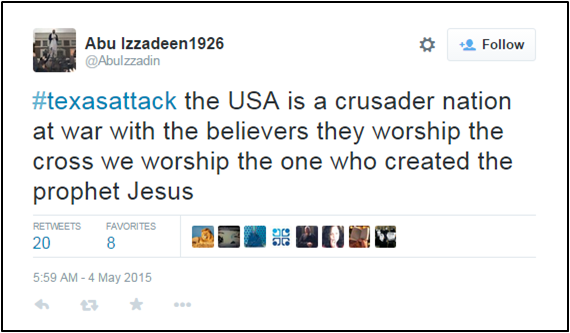 “#texasattack the USA is a crusader nation at war with the believers they worship the cross we worship the one who created the prophet Jesus” (Tweet)Abu Izzadeen1926, Twitter post, May 4, 2015, 5:59 a.m., https://twitter.com/AbuIzzadin/status/595165906554253313. “#texasattack competing to insult the messenger Mohammed that is the issue under the guise of freedom of speech they declare war on Islam” (Tweet)Abu Izzadeen1926, Twitter post, May 4, 2015, 5:56 a.m., https://twitter.com/AbuIzzadin/status/595165099138101248. 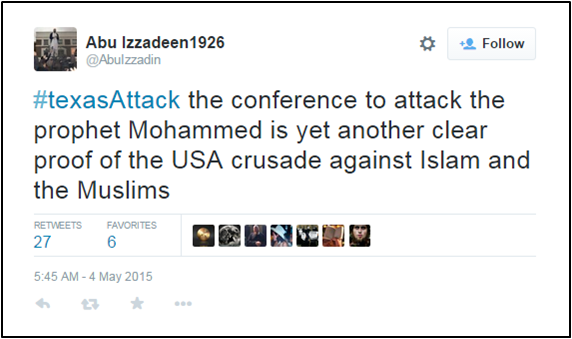 “#texasAttack the conference to attack the prophet Mohammed is yet another clear proof of the USA crusade against Islam and the Muslims” (Tweet)Abu Izzadeen1926, Twitter post, May 4, 2015, 5:45 a.m., https://twitter.com/AbuIzzadin/status/595162247216902144. “#SarrinMassacre noble peace prize winner Obama and thugs murder AhlSunnah children, premeditated murder of the young” (Tweet)Abu Izzadeen1926, Twitter post, May 3, 2015, 3:32 p.m., https://twitter.com/AbuIzzadin/status/594947595199488000. “It is a direct policy of war by the crusaders to murder Muslims regardless of age, race or gender #SarrinMassacre” (Tweet)Abu Izzadeen192, Twitter post, May 3, 2015, 1:19 p.m., https://twitter.com/AbuIzzadin/status/594914138436014080. “USCrusaders bomb Aleppo murdering ,17 members of 1 family! But wallahi it only increases our Emaan and conviction” (Tweet)Abu Izzadeen1926, Twitter post, May 1, 2015, 2:37 p.m., https://twitter.com/AbuIzzadin/status/594208982119645184. “#BaltimoreRiots Obama as no answers only the Islamic shariah provides for all citizens regardless of colour and race” (Tweet)Abu Izzadeen1926, Twitter post, April 28, 2015, 5:38 p.m., https://twitter.com/AbuIzzadin/status/593165813403746305. “When we speak about Rafidah we mean those who curse Abu Bakr, Omar Uthman and our Mother Ayhesha they r disbelievers” (Tweet)Abu Izzadeen1926, Twitter post, April 28, 2015, 10:13 a.m., https://twitter.com/AbuIzzadin/status/593055555863900164. “This is a war against Ahl sunnah with the enemy attempting to cage our lions/lioness but we will never be tamed” (Tweet)Abu Izzadeen1926, Twitter post, April 28, 2015, 8:41 a.m., https://twitter.com/AbuIzzadin/status/593032295436722177. “Those who fight Ahl Sunnah do so due to their belief it is the shirk that imbues them with hatred for the believers” (Tweet)Abu Izzadeen1926, Twitter post, April 26, 2015, 8:42 a.m., https://twitter.com/AbuIzzadin/status/592307835658186753. “The Sunnah is 2confront the disbelief openly, in a direct&forcefully manner wherever that may be #StayMuslimDontVote” (Tweet)Abu Izzadeen1926, Twitter post, April 26, 2015, 6:04 a.m., https://twitter.com/AbuIzzadin/status/592267970275110912. “How dare they [the police] come to the house of Allah. If they come to the mosque again they need to get ready for a funeral.Duncan Gardham, “Abu Izzadeen’s speeches,” Telegraph (London), April 17, 2008, http://www.telegraph.co.uk/news/uknews/1895856/Abu-Izzadeens-speeches.html. “That’s what a demonstration is all about. At a demonstration it’s about getting the point across and sometimes I do use insulting and abusive language but it’s nothing more than that. It’s rhetoric. When we are told about people being killed and tortured the only weapon we have is our tongue.“Accused ‘not sorry’ for UK deaths,” BBC News, March 4, 2008, http://news.bbc.co.uk/2/hi/uk_news/7277879.stm. “John Reid, Tony Blair and George Bush's crusade can all go to hell. You are an enemy of Islam and Muslims. Shame on all of us for sitting down and listening to him.”David Batty, “Reid barracked during speech to Muslim parents,” Guardian (London), September 20, 2006, http://www.theguardian.com/world/2006/sep/20/terrorism.immigrationpolicy. “Are you ready for another 7/7?”Duncan Gardham, “Muslim preacher Abu Izzadeen guilty of inciting terrorism,” Telegraph (London), April 17, 2008, http://www.telegraph.co.uk/news/uknews/1895959/Muslim-preacher-Abu-Izzadeen-guilty-of-inciting-terrorism.html. “Allah gave mujahideen chance to kill the American.”“Six guilty of terrorism support,” BBC News, April 17, 2008, http://news.bbc.co.uk/2/hi/uk_news/7352969.stm. The police are “the sons of pigs and monkey” and can “go to hell” for their “crusade” against Muslims.Duncan Gardham, “Abu Izzadeen’s speeches,” Telegraph (London), April 17, 2008, http://www.telegraph.co.uk/news/uknews/1895856/Abu-Izzadeens-speeches.html. The “only true leader of the Muslims is Osama bin Laden.”Duncan Gardham, “Abu Izzadeen’s speeches,” Telegraph (London), April 17, 2008, http://www.telegraph.co.uk/news/uknews/1895856/Abu-Izzadeens-speeches.html. “He [the Prophet Mohammed] said Allah will never put together the kuffar and the one who kill him inside the jahannam [hell]. So my dear Muslim brothers to kill a kaffar for the sake of Allah in jihad, be a way to the jannah [heaven] inshallah [god willing].Duncan Gardham, “Abu Izzadeen’s speeches,” Telegraph (London), April 17, 2008, http://www.telegraph.co.uk/news/uknews/1895856/Abu-Izzadeens-speeches.html. “So we are terrorists - terrify the enemies of Allah. The Americans and British only understand one language. It’s the language of blood.”Duncan Gardham, “Muslim preacher Abu Izzadeen guilty of inciting terrorism,” Telegraph (London), April 17, 2008, http://www.telegraph.co.uk/news/uknews/1895959/Muslim-preacher-Abu-Izzadeen-guilty-of-inciting-terrorism.html.